SilentOwl: The Apple and The Pentagram. A place where like minded people can get together. So why not pull up a chair,and sit awhile. You know you're never too old for a story. The Apple and The Pentagram. The pentagram is one of the most widely used religious symbols in the world and has been used by Wiccans, Pagans, Israelites, Christians, magicians amongst others. But what is its origin? 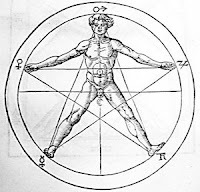 A pentagram is a five-pointed star with one point aligned upwards (when surrounded by a circle, it's known as a 'pentacle') and its name derives from the Greek words "penta", meaning five and the word "gamma", meaning letter. The pentagram was originally a symbol of the goddess, Kore, who was worshipped in many countries as widespread as England and Egypt thousands of years ago, but under many different names (i.e. Cara, Ceres, Carnak, Core, Car, Karnak, etc). Kore's sacred fruit was the apple. 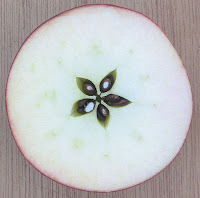 When cut through its equator, the apple has a near perfect pentagram shape inside, with each point containing a seed. Many Wiccans, Pagans and Roma (Gypsies) still cut apples in this way and the Roma refer to apple cores as Stars of Knowledge. The concept of five points is still symbolic in Ireland; "Ireland had five great roads, five provinces and five paths of the law. The fairy folk count in fives and the mythological creatures wear fivefold cloaks." 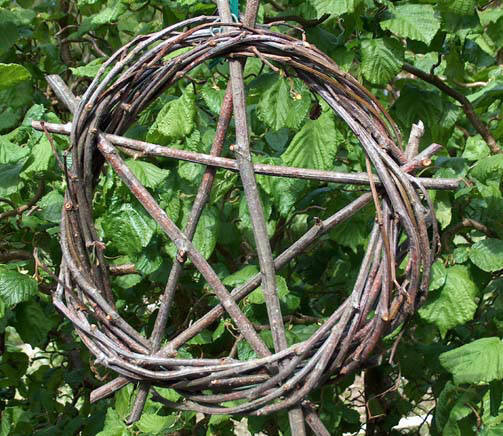 Wiccans use the pentagram symbol to cast and banish their healing circles, to bless themselves and others by tracing the shape on their bodies and often wear the pentacle or pentagram on pieces of jewellery. Some Wiccans interpret the five points as the five elements- earth, air, water, fire and spirit, while others interpret them as the four directions and the spirit. From childhood fairy tales such as Snow White to the discovery of gravity, the apple has influenced the world as we know it. Even centuries before an apple fell on Sir Isaac Newton’s head, the fruit has held a symbolic meaning through myth and legends. Although the symbolism of the apple has evolved throughout time, the apple has sustained its place in many cultures as a symbol for knowledge, prosperity, love, jealously and temptation. Apples are a natural remedy for the heart, stomach and bowels, our main organs of giving and receiving. Our folk memory puts forth such phrases as "An apple a day keeps the doctor away", and not without good reason. The apple's malic and tartaric acids neutralise the acid products of indigestion. A very digestible fruit, it provides excellent baby food, aiding the digestion of other foods. Constipation can be combated by eating a ripe, juicy apple at bedtime every night, this also helping to reduce sleeplessness and biliousness. This fruit is not only cleansing to the teeth, but its hardness pushes back the gums so the borders are clear of deposits. To get the full value of an apple it should be eaten unpeeled as its valuable acids and salts, to a special degree reside in and just below the fruit's skin. Apples have a long history of use in divination, especially to foretell the future in matters of love and prosperity. The methods of divination are varied and include counting the apple pips; burning the pips after naming each one with a young man's name and watching which ones explode in the fire; apple bobbing; throwing the peel over the left shoulder to see it forms the initial of an individual when it lands; and putting an apple under your pillow to dream of your sweetheart. All these games and folk customs are survivals of much older ceremonies in honour of the Apple. Many of these customs are performed particularly at Samhain, as traditionally the apple is linked to the Celtic Otherworld, where the tree is called the "Silver Bough" and possesses magical properties. Samhain is traditionally a time of the year when the veil between the worlds is at its thinnest, a doorway between the seen world of matter and the unseen world of spirit, which is the best time of the year to make shamanic journeys, to connect to the dead, the spirit realms, to gain oracular knowledge and healing powers. 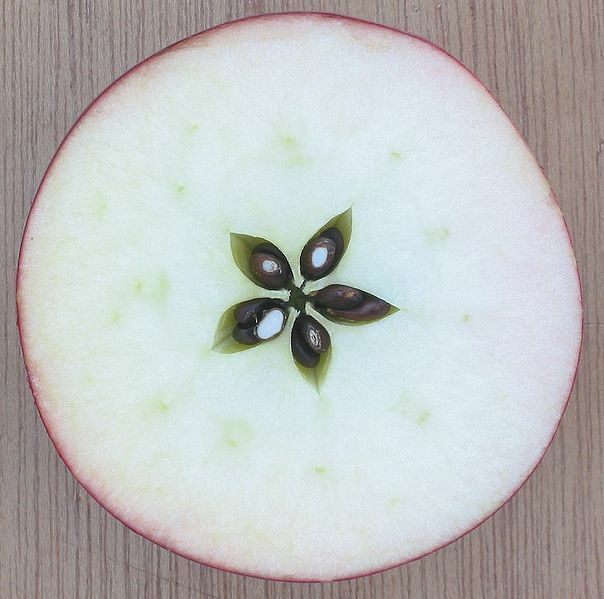 The pentagram can be found within the apple by cutting it across its width; the shape being revealed in the formation of its pips. 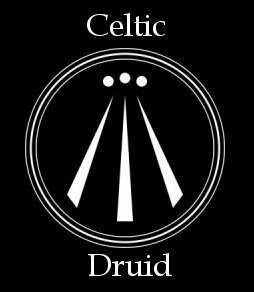 This ancient symbol of knowledge is sacred to the Celtic death Goddess, Cailleach, the Crone, the Veiled One, honoured at Samhain. Verjuice, a kind of scrumpy cider, was also her drink at this time of the year, inducing altered states and otherworldly experiences. Verjuice is made by gathering ripe crab apples, laying them in a pile and leaving them to rot and sweat. The rotten fruit is gathered into a bowl with the stalks removed, beaten to a pulp and pressed through a coarse cloth. The resulting liquid is then bottled and ready for use one month later. The Apple Tree has close links with the Shaman, the Wisewoman and the Magician and used when undergoing magical transformation or Otherworld journeys. Celtic Arthurian Myth names one of these Otherworlds as Avalon, the Apple Vale, the mythical paradise where hills were clothed with trees bearing flowers and fruit together. Merlin reveals to his Lord the existence of his orchard. It was borne from place to place by the Enchanter on all his journeys. Other legends tell of Otherworld visitors to our World appearing in the same guise as the Shaman, carrying an apple branch with bells on it. The Apple tree also represents Shelter, either in this World or as a place to rest when making Otherworld journeys. An apple wood wand would be the appropriate magical tool to use to make Shamanic journeys to the Otherworld. It is said that the Apple is used as a calling sign to the Otherworld that you wish to enter their realm. The wand will help you physically, mentally and spiritually connect to the Apple tree. The Ogham system links the apple to the spiritual warrior; one who is unafraid to make the journey to the Otherworld and back, one who is unafraid to face death or madness. This is the divine madness of the Shaman. Mad people held a different place in Celtic society. Their madness was believed to be a gift and a rare ability, which link them to the Otherworld, oracular knowledge and meaningful insights. In today's society madness is feared, suppressed and hidden away. Wassailing, for instance; the idea of waking up the tree's spirit so that it could get on with the job of making apples on which everyone so depended, was considered perfectly acceptable in the past, but in today's society, it would be considered quite mad. it helps with genetic memory cognition... which helps regular memory as a side effect. An apple a day keeps the doctor away. There is many a truth in old folktales. Thank you for your comments. Foundation Sacrifice or Sound Box. The Claddagh Ring. The Irish Wedding Ring. Superstitions about sea faring folk. Animals in Celtic Cultural Belief. Cromm Cruaich, Crom Dubh. Lord of The Mound. The Rabbit and the Hare. The Serpent and Saint Patrick. Caer. The Swan Maiden of Aengus. Aengus. God of Love and Inspiration. Goibhnui. God of Blacksmiths and MetalCraft. Balor of the Evil Eye. Dobhar Chu. The Irish Crocodile. I am a Druid. I enjoy reading. Herbalism, Folklore, gardening, the changing seasons. I am a member of the Heritage in Schools Scheme and visit National Schools to teach aspects of Irish Heritage. I am a professional storyteller/séanachái and I am also an author. 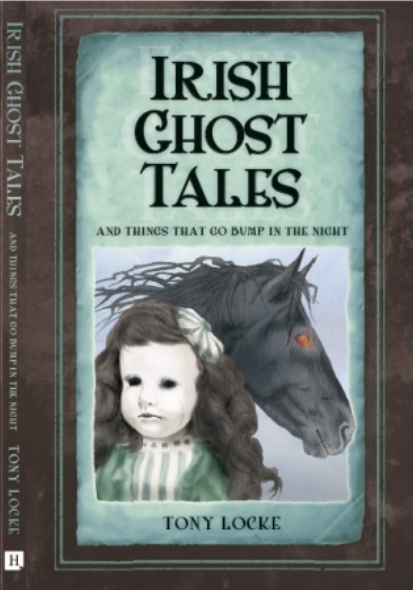 Irish Ghost Tales and Things That Go Bump In The Night. Irish Ghost Tales and Things That Go Bump In The Night. Due for release in October 2015. 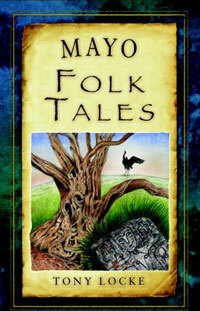 This blog reflects my interest in Irish folklore. Superstition and Paganism. I welcome any and all comments. However, racists and bigots are not welcome. Folklore is the unwritten stories, songs and superstitions of a culture and yet it is so much more than that. If history is the skeleton of a people then folklore puts flesh onto its bones creating a living breathing entity. It is a true expression of the people, forever evolving, changing and being added to.